Contact me if you are interested in larger wholesale quantities of this or other products. Fits original manufacture part numbers below: #904979-02 (DC07 only), 905401-01(DC14 only) Replaces Original Dyson Part Numbers: 901420-02, 90142002, DC-07-14 Part #10-2310-05 Designed to fit the vacuum models listed below and more: Dyson Vacuums: Style	Model Numbers All Floors	DC07/DC14 Low Reach	DC07/DC14 Animal	DC07/DC14/ Full Gear	DC07/DC14/ All Floor HSN Exclusive	DC18 Dimensions: Diameter 5 ½", Height 1 5/8" HEPA Filtration system traps and seals-in 100% of Microscopic Particles, Bacteria, Dust Mites, Mold, pollens, allergy causing agents, and Germs as small as 0.1 micron and 99.9% of pet dander Cleaning and replacing filters regularly extends the life of your vacuum. If the suction power of your vacuum seems to be less, changing the filter might be a good option and help you avoid costly repairs. 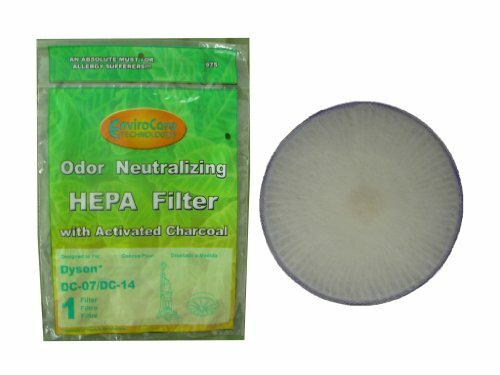 Although this filter is lifetime, experience has shown that it should be inspected at least once a year. Use a flat head screwdriver to remove the filter. If you notice black soot starting to accumulate, consider replacing the filter. Do Not wash this filter because the material is so dense it is difficult to dry; the moisture may damage your motor. Dimensions: Diameter 5 ½", Height 1 5/8"